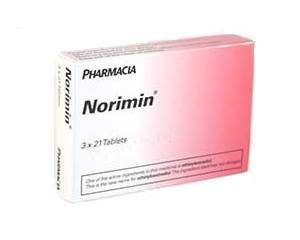 Norimin is a combined oral contraceptive pill. It makes your body think that ovulation has already occurred, it prevents ovulation. The hormones affect the production of natural cervical mucus. It increases the thickness of this mucus. Sperm will not be able to reach the uterus as well. You use Norimin to prevent pregnancy. The use of Norimin may result in a lighter, less painful and more regular menstruation period. Women with unwanted menstrual complains may benefit from the use of Norimin. You should take one tablet daily for 21 days, after 7 days an intermission follows. You will menstruate during that period. Then you will begin the following strip, even if you still slightly bleed. The tablets are marked with the days of the week. You start taking the pill on the first day of your period. Swallow each pill as a whole, with water if necessary, without chewing. Note: Take the pill everyday at the same time, inconsistent use may alter the contraceptive effect negatively. Healthy women who do not smoke virtually run no risk of serious side effects. Sometimes, however, some experience side effects. If these persists for longer than three months, it makes sense to contact a doctor. The following side effects may occur when using Norimin. For the full list of side effects, see the package leaflet. Norimin will not protect against sexually transmitted diseases. It is important to ensure that Norimin is the right contraception for you. Norimin is suitable for most healthy young women, but it should not be taken when you are pregnant.